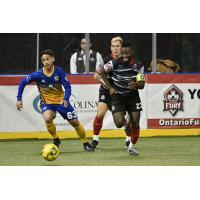 Ontario, Calif. - Despite another spirited final-quarter rally, the Ontario Fury fell 4-2 to visiting Major Arena Soccer League (MASL) giants San Diego Sockers on Thursday night. Trailing by three at the end of the third period, the Fury managed to make it interesting with a pair of consecutive tallies but fell just short of completing the comeback, as they drop to 7-8 on the season and to third in the Pacific Division behind the Tacoma Stars. 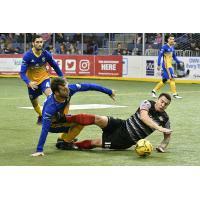 Sockers forward and ex-Ontario standout Leonardo De Oliveira recorded a goal and an assist against the club which traded him away in the offseason. In a fiercely contested opening quarter that featured little in the way of scoring chances, Fury netminder Chris Toth did make an outstanding one-on-one save against his former team to keep the score level. However, Toth would be helpless when De Oliveira subsequently netted on a late power play, converting an assist by Hiram Ruiz. Ontario cranked up the intensity in the second quarter and forced two quality stops from Boris Pardo. First the San Diego shot-stopper went airborne to keep out a stinger by MASL leading goalscorer Adrien Perez. Then he produced a point-blank foot save to deny an unmarked Juan Carlos Gonzalez at the right post. Before the end of the period, the Fury's Toth would prove his worth as well, tipping a dangerous Raymundo Contreras drive over the frame. The 29-year-old 'keeper had luck to thank moments later, as a Kraig Chiles rocket rattled the crossbar. Ontario continued to play with intent after the interval and came agonizingly close to collecting the reward when Victor Quiroz sent a shot off the left upright. The home side's pain grew exponentially on the immediate counter-attack, a streaking Brandon Escoto finishing off the textbook play by tapping home De Oliveira's ball across from the right. Travis Pittman then made it 3-0 on a ball off the boards by Christian Gutierrez and the Fury nearly fell behind by four, if not for Israel Sesay's last-ditch goal-line clearance on a Cesar Cerda effort with Toth away from the net. Sesay's side very nearly struck at the other end mere seconds later, the ball quickly being moved down the field and to the feet of Perez, who fired a shot off the post. Perez' teammate McNeley came even closer to getting the hosts on the board, as he was picked out on a free-kick and beat Pardo with a precise drive across goal and inside the left upright, only to see it scraped away at the last moment by defender Contreras. Ontario would finally get one back in the game's closing period. Perez took full advantage of an unnecessary giveaway by Pardo, picking out Brazilian Francisco Cordeiro for a simple finish. San Diego netminder Pardo redeemed himself shortly thereafter, as his diving save on an opposition power play kept out a wickedly deflected Juan Carlos Gonzalez drive. However, the home side did cash in seconds before the end of the man advantage, Francisco Cordeiro setting the stage for a dramatic finish by cleverly sticking out his toe on a Perez drive and deflecting the ball home to cut the deficit to one. Despite the Fury even sending goalkeeper Toth up in the closing stages, it wasn't meant to be for Head Coach Jimmy Nordberg's men, who saw their remaining hope evaporate when Guerrero Pino aimed perfectly from about the halfway line and found the open net to put the game out of reach at 4-2. With the hunt for a postseason berth heating up, Ontario will look for a much needed win when it welcomes Southwest Division bottom dwellers El Paso Coyotes to Citizens Business Bank Arena on Sunday, February 17. Tickets to all Fury home games at Citizens Business Bank Arena may be purchased by by visiting www.ontariofury.com or by calling 909-457-0252.